The European debate on populism brings the Left’s fundamental identity into question. Review of Eric Fassin, Populisme: le grand ressentiment (Textuel, 2017). Despite the word’s association with the worst elements of the Right, some on the Left have also embraced populism as the wave of the future — none more articulately or more consistently than the Belgian philosopher Chantal Mouffe. Since the early years of Margaret Thatcher’s premiership, she and her late husband Ernesto Laclau have argued that the contemporary center-left has lost its way. Even as the neoliberal turn was just beginning to take hold — eroding social protections, creating a pauperized and precarious workforce, and enriching a narrow oligarchy — Mouffe castigated Third Way social liberals like Tony Blair and Bill Clinton for adopting a politics of “consensus” that failed to give people a voice for their discontent. As the social destruction of neoliberalism intensified over the years, Mouffe has argued that “de-politicized” center-left parties have failed to provide a forceful alternative. As a result, Mouffe believes that we are currently in the midst of a crisis in which political institutions no longer appear adequate to voice popular demands — a crisis to which “populism” is the only solution. Mouffe’s notion of populism is drawn from her understanding of democracy as a realm of conflict, in which adversarial groups struggle against one another for hegemonic control of the political terrain. Democratic politics is not about consensus, but about asserting an “us” against a “them.” Mouffe claims that the Right has long understood this, so the Left has to get with the program if it is to have a future. But for Mouffe and the European movements that have claimed her as an inspiration — including Syriza in Greece, Podemos in Spain, and France Insoumise in France — left populism is more than a necessity for survival. If the Left can succeed in building movements that speak in terms of “the people,” against the oligarchy or the 1 percent, she is confident that it can not only defeat the racist and xenophobic populisms of the far right, but create a new political order beyond neoliberalism. Fassin’s charge is not that today’s left populists are secret Thatcherites, nor even necessarily that their actions will lay the groundwork for further neoliberal or right-wing gains. Rather, he believes that the political strategy Mouffe advocates is premised on a hopeless attempt to win a certain type of right-wing voter over to the Left. Many contemporary populist movements — including those on the Left — present themselves as attempts to transcend the division between left and right. They could hardly do otherwise, since populism seeks to recast the terms of political struggle as a “vertical” opposition between the powerful and “the people,” a category that cannot plausibly be limited to the traditional bases of left or right parties, whether defined in ideological or sociological terms. Mouffe and her allies, then, are not only seeking to criticize the traditional institutions of the Left for being out of touch with the people. They aim to build an entirely new social base for the Left, one that is independent of existing parties, unions, and associations, and that includes all those impoverished and alienated from politics after decades of neoliberalism. Among these ranks of the disaffected, Mouffe and the politicians close to her claim to find many who have supported populist movements of the Right. Though a great many far-right voters are sincere racists, xenophobes, or neofascists, left populists generally believe that it’s both possible and necessary to provide an alternate, anti-racist expression for the anger these people feel. Since unlike right populism, left populism understands the real sources of this anger — that is, neoliberalism and its consequences — it claims that its message will ultimately prove more powerful to those who otherwise would vote for the likes of Trump, Farage, and Le Pen. Fassin contends that this element of left populist thinking is not only empirically false, but also politically quixotic. He argues that the common view of Donald Trump’s supporters as Americans “left behind” by neoliberal globalization is a fiction. The typical Trump voter was not an unemployed factory worker, but rather a middle- or upper-middle-class white man. For Fassin, this feeling of resentment is a defining feature of the contemporary world. To a large extent, it has resulted from the creation of relatively privileged classes in economic terms who nonetheless lack what Pierre Bourdieu called “cultural capital.” Members of these classes — depicted brilliantly by the novelist Michel Houellebecq in his numerous white male protagonists — feel a profound insecurity, which produces a violent emotional response. They come to hate both highly educated liberals for parading their cultural elitism and progressive values in their faces, and the underprivileged classes that these “woke” elites appear to care about more than them. It is no mere historical accident, then, that populism played a key role in the construction of neoliberalism under the right-wing governments of the 1980s. As a political rhetoric and praxis, populism is inherently cultural, Fassin explains, which has made it an ideal tool for right-wingers from Reagan and Thatcher to Trump. The Right’s primary intention over the last four or so decades has been to mobilize the white middle classes for the benefit of the neoliberal elite, and cultural populism made it possible to present this effort as a defense of “the people” against decadent liberals and the black and brown underclasses. Fassin therefore dismisses the left populist idea that there is a base of far-right supporters whose anger can be diverted from racist populist movements to egalitarian ones. There is no subconscious desire for economic justice underneath a vote for Donald Trump or the Front National, only resentment towards perceived cultural superiors and racial inferiors. For Fassin, populism simply is resentment. Leftists can dress their ideas in populist rhetoric all they want — they can, for example, personalize their critique of neoliberalism by denouncing members of “the oligarchy” and their cultural worldview. But Fassin insists that to the extent that the Left chooses to go this route, it sacrifices properly leftist ideas and methods for a rhetoric of cultural warfare that originated on the far right, but can never satisfy the resentments and insecurities the far right feeds on. Though in some respects Fassin and Mouffe may have more in common than either might want to admit, their divergence on the degree of porosity between left and right is crucial. In this respect, Fassin’s critique helps identify what’s so novel about populism for the contemporary left — but also why it might not be the salvation its partisans believe it to be. Advocates of left populism believe that in today’s neoliberal “post-democracies,” populist strategies and rhetoric provide the only path towards a successful left politics. Although Mouffe has done more than anyone to provide consistent arguments for this position, she has a tendency to flip her own reasoning on its head. Reading Mouffe’s latest book, one senses that for her, if any movement succeeds in staking a position to the left of mainstream social liberalism, it must be a left-populist movement. This results in some peculiar claims. For example, early in For a Left Populism, Mouffe clearly states that the established social-democratic parties “have become too deeply integrated within the neoliberal hegemonic formation” to pose an authentic left alternative to neoliberalism. But throughout the rest of the book, she goes on to praise the populism of Jeremy Corbyn, the left-wing leader of the party of Tony Blair. And despite the fact that Bernie Sanders chose to run in 2016 as a Democrat and later campaigned for the arch-centrist Hillary Clinton, we learn that he too is “clearly” a left populist. But as for the continental movements that have aligned themselves with Mouffe’s ideas, it’s far from clear that they share a common strategy with Corbyn and Sanders (who are themselves hardly identical to one another). Fassin helps to clarify the important difference between these Anglophone figures — though Kevin Kühnert’s youth insurgency within the German Social Democratic Party could be added to the list — and the explicitly populist left movements in countries like Spain and France. It’s not merely that Sanders and Corbyn work with and within established parties; both leaders have sought to move these parties to the left by providing an updated left message that can mobilize unmistakably left-wing bases. Of course, these bases change over time: successful campaigns neither shrink from embracing new constituencies nor let themselves become overly attached to voting blocs it has lost. Thus, if Fassin has more admiration for what the Left is doing across the Channel and the Atlantic, it may be due to the fact that Corbyn and Sanders are simply more effective in identifying which voters are on their side, reaching out to them, and offering them what they want. Perhaps they’re not so much populists as merely good politicians — better ones at least than the centrists in their parties. Movements like Podemos and France Insoumise, on the other hand, set themselves a far more ambitious goal. Following Mouffe’s notion of replacing the left-right divide with an opposition between the people and the elites, they make it a priority to win over to left-wing causes voters whose orientation may be fundamentally of the Right. Though such populist attempts to overcome traditional definitions of left and right may not be without their modest successes, Fassin suggests that the Left might not need to break so radically with its traditional institutions and sociological bases. That is to say, it might be possible to embrace some of Mouffe and Laclau’s philosophical insights — the conflictual nature of democracy, the role of hegemonic formations in politics — without embracing populism and all its oversights. 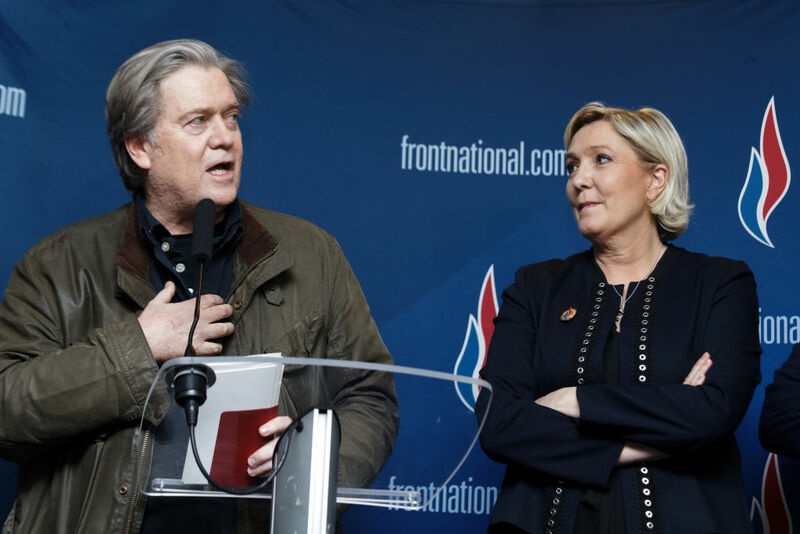 Left-wing populists like Mouffe have a compelling account of how someone like Steve Bannon can pose as a champion of the common people. But Fassin’s little book suggests that to find a way out of this state of affairs, the Left may not be in such dire need of new ideas that it has to go looking for new supporters among those who might believe him. Jacob Hamburger is a Chicago-based writer and translator. He runs the blog Tocqueville 21, which focuses on global democracy in the twenty-first century.